What is a direct weld? A direct weld is a standard spot weld where the current path is directly through the workpiece between opposing electrodes. This is the easiest weld to produce. The electrodes size and face shape can be optimized for the application. The face can be radius or flat to produce the desired spot weld. What is the conversion of gage number to dimensions? On many specifications the material call-out is a gage number. If you are not familiar with this term you cannot go forward with a weld schedule. 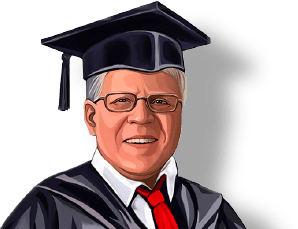 You must know the material thickness which is what the gage number represents. 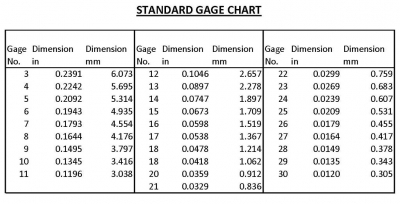 Below is a table showing the gage size standard for steel sheetmetal. What are the advantages of resistance brazing? First it allows the joining of materials that otherwise cannot be resistance welded. Generally they are very conductive materials and hard to get hot enough to form a weld nugget. Coppers and brasses would be an example of these. Secondly a resistance braze can be performed at a lower temperature than a spot weld. We do not have to bring the work piece up to near its melting point. We only need to bring the braze shim to its melting point which is much lower. This means the work piece can preserve some or all of its mechanical properties. Post heat treatment may not be necessary. The third advantage is that we can control the area of heat application to a small area of the part. We are only heating to a modest temperature and we can protect other areas if desired with cooling. The rest of the part stays strong for the end application. How do resistance brazing schedules vary from spot welds? The goal of a resistance brazing schedule is to bring a thin sheet of braze alloy to its melting point and form a fillet around the periphery of the part being joined. The squeeze cycle is basically the same as in spot welding – put the parts under the desired holding force. The off cycle is the same – cool and resolidify the braze material. What varies is the weld or heating portion of the cycle. Spot welds generally take a few cycles, or milliseconds. The time is generally less than a second. A resistance braze frequently will take several seconds up to many. It depends upon the size of the part and how conductive the material is. How much force is used for resistance brazing? In resistance brazing we are not spot welding but we still are passing modest currents so an adequate force is necessary to avoid arcing. The main goal of the force is to hold the parts together for current flow and avoid arcing so the braze alloy is not arced out of the joint. This is usually a modest force developed by trial with set up parts. Joule Heating H= I2rt will then generate the energy necessary for the braze material to melt. When molten braze metal is visible in the filet the current can be turned off and allowed to cool under pressure until solidified. Then the electrode can open and the part is ready to be ejected or removed. The temperature that the part reached at the joint is lower than it would have been if spot welded but it will be hot so caution is required.